Phospho-β-Catenin (Ser552) (D8E11) Rabbit mAb (upper) or β-Catenin (6B3) Rabbit mAb #9582 (lower). 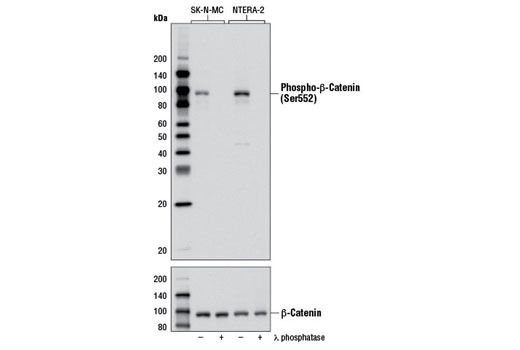 Phospho-β-Catenin (Ser552) (D8E11) Rabbit mAb detects endogenous levels of β-catenin protein only when phosphorylated at Ser552. Monoclonal antibodies are produced by immunizing animals with a synthetic phosphopeptide corresponding to residues surrounding Ser552 of human β-catenin protein. Both Akt and PKA were shown to phosphorylate β-catenin at Ser552. Phosphorylation at Ser552 induces β-catenin accumulation in the nucleus and increases its transcriptional activity (9-11). He, X.C. et al. (2007) Nat. Genet. 39, 189-198.